On Wednesday, March 14th, we are honoring the 17 victims from Strongman Douglas High School with 17 minutes of silent starting at 10 am. 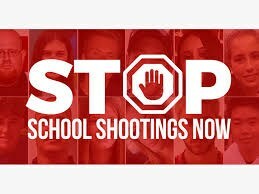 We ask that scholars, teachers, and staff stand in solidarity against school gun violence. El Miércoles 14 de Marzo honraremos a las 17 víctimas de Strongman Douglas High School con 17 minutos de silencio a partir de las 10 am. Pedimos que los eruditos, maestros y el personal se solidaricen con la violencia armada en la escuela.